Tom Hardy used this workout for the movie “The warrior”. This exercise is very intense so be prepared. Start in modified press-up. Lower your body until your chin reaches the ground. Raise your head and shoulders while lowering your hips until they almost touch the floor. Come Back up. Grab the bar using with underhand grip. Cross your ankles, with the toes of one foot resting on the bench hang from the bar and pull your chest up, pause, lower, and repeat. Put your feet on a bench and your hands on the floor. Raise your hips so your torso is nearly vertical. 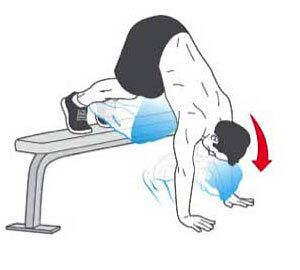 Bend your elbows until your head nearly touches the floor, then push back. Lean forward with a pair of dumbbells, then pull the weights up to your sides. Reverse the movement to return to the start. Do 6 reps of each move, then 5 and count down until you reach 1. If you manage to do one of the exercises in under 15 minutes add a rep to your first set next time.